January 4, 2014 /Photography News/ There were no fireworks on the sun to welcome in the New Year and only a few C-class flares during the last day of 2014. 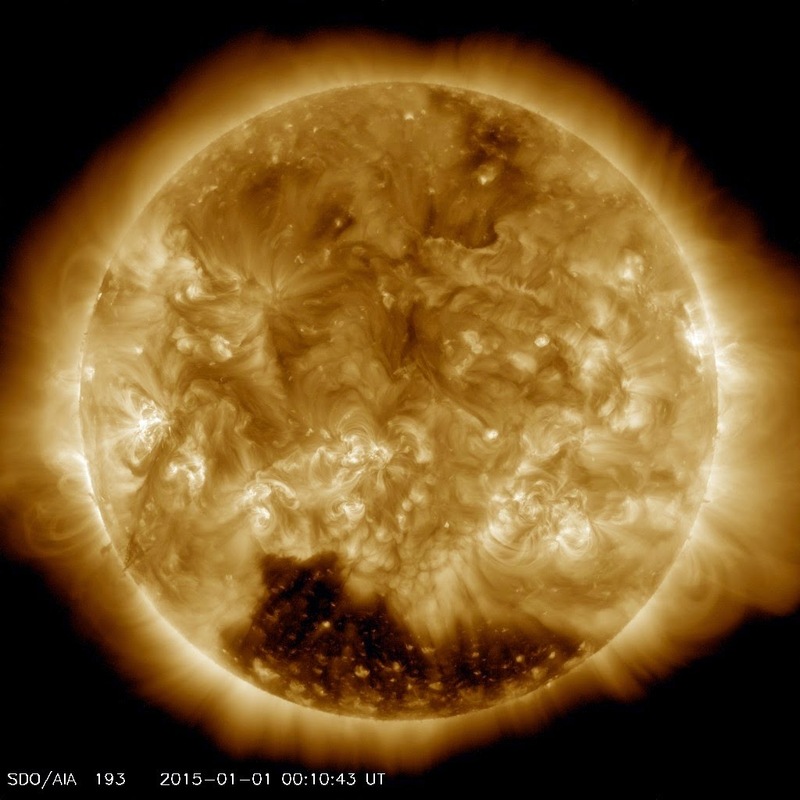 Instead, the sun starts 2015 with an enormous coronal hole near the south pole. This image, captured on January 1, 2015 by the Atmospheric Imaging Assembly (AIA) instrument on NASA's Solar Dynamics Observatory, shows the coronal hole as a dark region in the south. Coronal holes are regions of the corona where the magnetic field reaches out into space rather than looping back down onto the surface. Particles moving along those magnetic fields can leave the sun rather than being trapped near the surface. Those trapped particles can heat up and glow, giving us the lovely AIA images. In the parts of the corona where the particles leave the sun, the glow is much dimmer and the coronal hole looks dark. Coronal holes were first seen in images taken by astronauts on board NASA’s Skylab space station in 1973 and 1974. They can be seen for a long time, although the exact shape changes all the time. The polar coronal hole can remain visible for five years or longer.